faulhaber.IT – …everything on middleware, containers and cloud technology. …everything on middleware, containers and cloud technology. This quick tip describes how to use your custom built docker images on OpenShift Online (Red Hat’s SaaS based container platform). Login to OpenShift Online at https://manage.openshift.com/ and create a new project (for the sake of this demo I use “my-external-project” as the name for it). Click of the question mark (upper right corner) and select “Command Line Tools”. Then copy your access token into your clipboard according to the instructions shown. If the connection can be established you should receive a “Login succeeded” message. In the background OpenShift Online will import the image into its internal registry and will furthermore create an according image stream for it. Have fun bringing your own Docker based applications onto OpenShift Online! In the default config of our Ansible Service Broker the APB’s are pulled from “https://registry.hub.docker.com/”. We need to change this to our local registry running within CDK. The Ansible Service Broker pod now needs to be restarted in order to pull in the new configuration. Now you should be able to see your first APB in your CDK’s service catalog. I am an active long time user of Eclipse and Red Hat’s distribution called JBoss Developer Studio (https://developers.redhat.com/products/devstudio/overview/). The tool suite has a very nice feature called Eclipse Secure Storage, which allows me to save development related passwords (Github, OpenShift, etc.) in a secure manner on my local system. However, in the last couple of months I regularly had problems with Eclipse Secure Storage feature not allowing me to use/save any passwords. Even reinstalling and deleting user specific preferences in my home folder did not work. If you google for this type of problem you’ll find a number of users reporting similar issues, but neither a resolution nor a proper workaround. Open the “Keychain Access” application. Search for an entry called “equinox.secure.storage” and delete it. 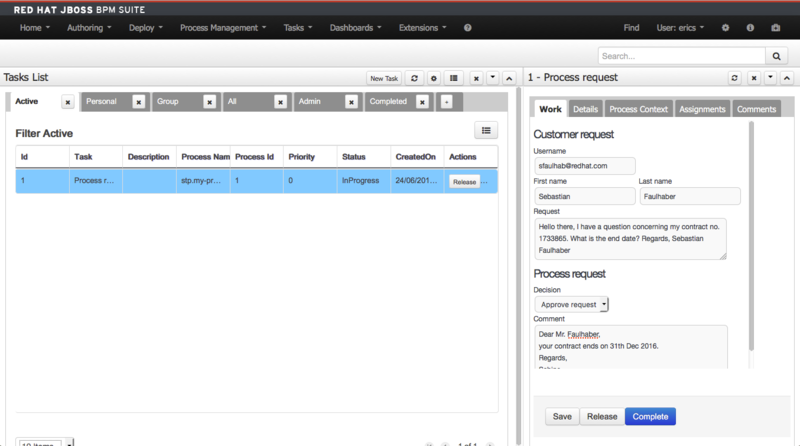 Open JBoss Developer Studio and go to Preferences. Open the “Secure Storage” preferences and delete the entry “[Default Secure Storage]”. Be aware that you saved passwords are lost by doing this. Restart JDBS and try to save your passwords again. A lot of customers would like to give the brave new container world (based on Docker technology) a try with real life workload. The WordPress content management system (yes, it has become more than a simple blog) seems to be an application that many customers know and use (and that I’ve been asked for numerous times). From a technical point of view the WordPress use case is rather simple, since we only need a PHP runtime and a database such as MySQL. Therefore it is a perfect candidate to pilot container aspects on OpenShift Container Platform. Create a new project and import the template for an ephemeral MySQL (since this is not included in the CDK V2.3 distribution by default). If you prefer to use another database or even one with persistent storage, then you can find additional templates here. Now we create one pod for our MySQL database and create our WordPress application based on the source code. OpenShift will automatically determine that it is based on PHP and will therefore choose the PHP builder image to create a Docker image from our WordPress source code. We now have a pod that runs our WordPress application (web server, PHP, source code) and one pod running our ready to use ephemeral (= non-persistent) MySQL database. Now it is time to setup and configure wordpress. Simply click on the route that has been created for your wordpress pod (in my case the hostname is “http://wordpress-wordpress.rhel-cdk.10.1.2.2.xip.io/wp-admin/setup-config.php”). Congratulations for installing WordPress on OpenShift! For now we’ve created all the resources manually in a not yet reusable fashion. 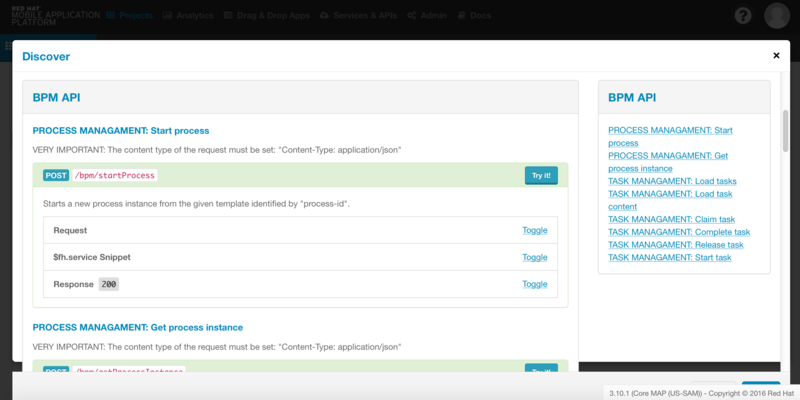 Therefore one of the next steps could be to create a template from our resources, import it into the OpenShift namespace and make it available for our users as a service catalog item. So our users could provision a fully installed WordPress with the click of a button. Many business processes in Germany involve paper (or better TONS OF PAPER!) and surely many manual steps: think of opening a bank account or registering a car at your local “Zulassungsstelle”. In my opinion one of the main reasons for that is that the identity of a user cannot be properly verified online. You could now argue that things like video identification or Deutsche Post PostIdent came up to address this problem. However this only solves part of the problem, since the signature still needs to be done manually. In Germany the so called nPA (neuer Personalausweis) is able to solve this problem by providing a qualified signature. So you will be able to digitally sign contracts online. Therein lays the potential to completely transform tons of paper-based processes. And huge amounts of time and money could be saved as well! The nPA has two main functions “Identification with Online-Ausweisfunktion” and “Electronic Signature”, which allow to implement many exciting use cases. These range from simple verifications (like age check, address validation) to login mechanisms for websites (the nPA can be considered as a single-sign-on system in this context). Moreover the nPA also allows to apply a qualified digital signature to documents, which is equal to a genuine signature (according to German law). A complete list of applications can be found here: http://www.personalausweisportal.de/DE/Buergerinnen-und-Buerger/Anwendungen/Anwendungen_node.html. However, from my perception the adoption still leaves a lot of room for improvement. There is extensive documentation available which describes the technical architecture behind the eID system (personally I recommend the information from BSI found here: https://www.bsi.bund.de/DE/Publikationen/TechnischeRichtlinien/tr03130/tr-03130.html). That it why I do not want to go into the nitty gritty details. However, to give you a rough understanding have a look at the following illustration, which looks similar to what is available in token based authentication systems (think of SAML and/or OpenID Connect concepts). There is something like a service provider (“WebServer”) who wants to protect a service; then an authority that is able to validate the identity (“eID-Server”); and a login component (“AusweisApp”) that allows the end user to enter login information like a PIN. Last but not least the user must have a card reader connected to his local system, which talks to the login component (“AusweisApp”). It is important to understand that the login component (“AusweisApp”) is implemented as a standalone application, which must run on the user’s computer (and of course be installed beforehand). For 2017 it is planned to release mobile versions of the app (see Google Play Store) in order to use a mobile device as a card reader. In my opinion this will help to reduce the overall complexity from an end user’s perspective. When looking at the system from a service provider’s point of view (e.g. I am an online shop provider who wants to enable users to login with their nPA), you have to consider a lot of things. Since their is neither a public instance of the “eID-Server” nor source code available, you have two options: create your own implementation based on the BSI spec or buy the service from a provider. Additionally you will have to think of how to integrate the token into your application: since there is no “reference implementation” of the “eID-Server” spec there is little to no documentation available. Overall the process feels rather complex and intransparent to me. A detailed description of the application process can be found here: “Become Service Provider”. There is no public eID-Server instance that can be used by public and private institutions. This makes the adoption unnecessarily complicated because all service providers have to find a solution for themselves. Little documentation for service providers available. Instead only tons of specs available that need a lot of work lifted by the service provider. Many services require that you map your eID to the identity in their system (at least once). This makes the process very uncomfortable for the end user. Currently an external card reader is needed. Firstly it has to be bought by the end user and secondly this does not work on the go. Fortunately this caveat has already been addressed with the mobile app version. My final thoughts: the adoption cannot be forced by laws. Instead, I think that the eID system should be developed in a more transparent and community based manner. Moreover the integration by service providers should be as easy as putting a social login on my personal website. A lot has happened in the area of mobile since Apple kicked off the revolution by announcing the first iPhone. However, the overall mobile market still has to be considered as young and especially unstandardized. This really puts a lot of organizations in front of huge challenges concerning the efficient development of mobile applications and the secure integration into backend IT systems. But there is no way around mobile in the next years! The smart combination of mobile techniques (MBaaS, micro services, etc.) and business process management approaches will definitely drive process efficiency and speed to a whole new level. 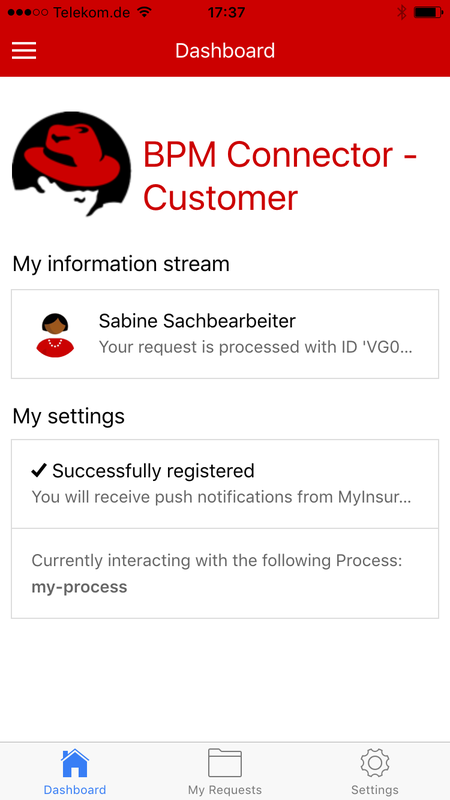 This showcase addresses a scenario that almost all enterprises in the insurance industry are facing: nowadays users expect to be able to contact their insurance 24/7 on an ad-hoc basis (e.g. for opening a claim or just for asking a question concerning their policy). 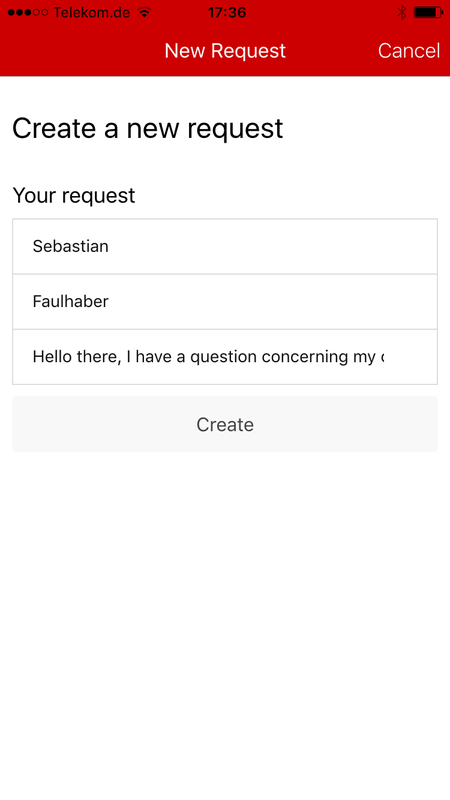 Additionally they want to see on demand what the status of a certain request is. From an enterprise point of view insurances are looking at new ways on reacting to this new speed of communication and transparency. They’re also thinking of new concepts to efficiently integrate agencies and remote workers in their existing processes. They key consequence to address these requirements is to enhance existing input & output management infrastructure by a newly established mobile channel. 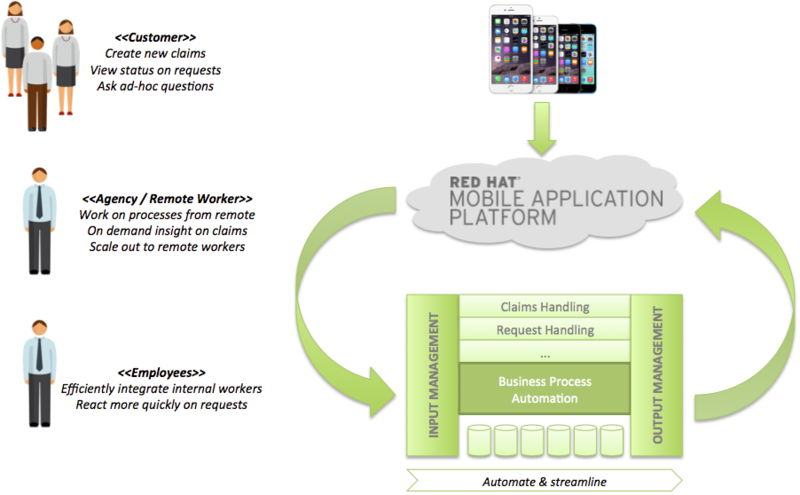 In this showcase we used Red Hat Mobile Application Platform (https://www.redhat.com/en/technologies/mobile/application-platform) as a key building block to efficiently and securely connect the outside world with existing enterprise systems. Through the platform approach we do not need to reinvent the wheel for each mobile app on the horizon. Instead we put in place a centralized platform for developing and running mobile application in a standardized manner. Customer App: This app is meant to be used by our end customers (using a broad range of different mobile devices) and has therefore being implemented especially with hybrid app development principles in mind. 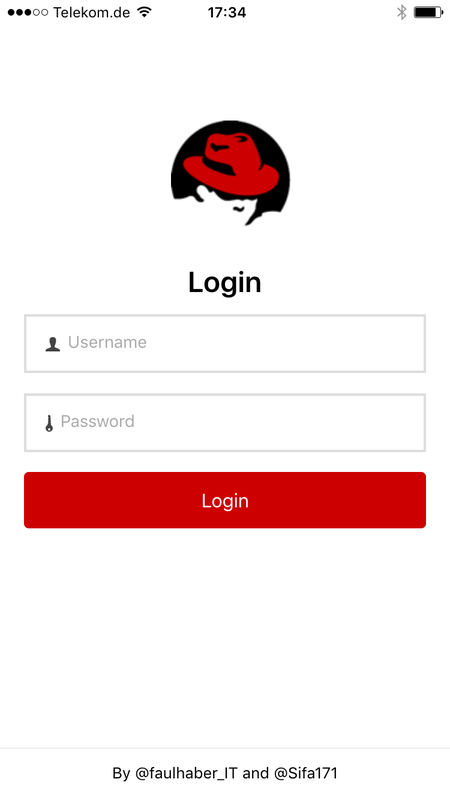 We chose Apache Cordova (https://cordova.apache.org/) as our core development framework, which enables us to build our app against all common mobile OS with only one code base (“develop once, run everywhere” principle). 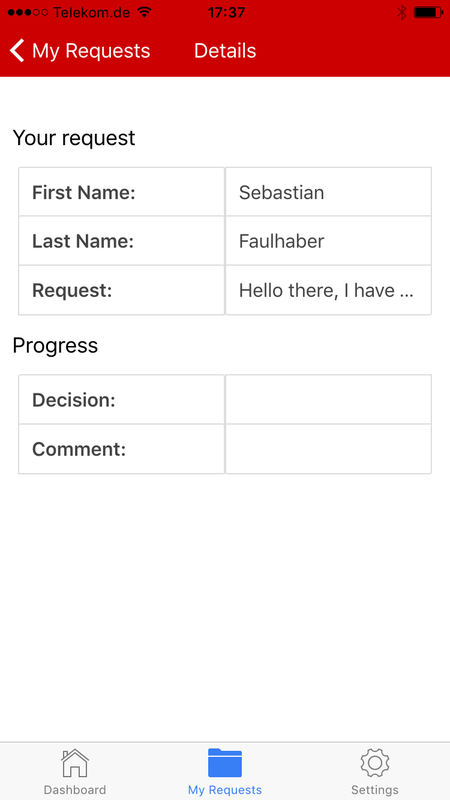 In terms of the UI and application framework we decided to go for a combination of ionic (http://ionicframework.com/) and AngularJS (https://angularjs.org/). Both projects have a vibrant and active community and have been successfully adopted by many projects. Employee App: This app targets remote workers (such as insurance agencies e.g.) who shall work on our processes from remote. We’ve decided to go for the same hybrid app approach in order to share code and speed up development. However, for such an end user group where we might influence the use of certain device types (such as Apple iPhone) we could have also thought about a native app (RHMAP provides an SDK for all popular mobile OS; so we could also reuse existing backend functionality in our cloud layer). 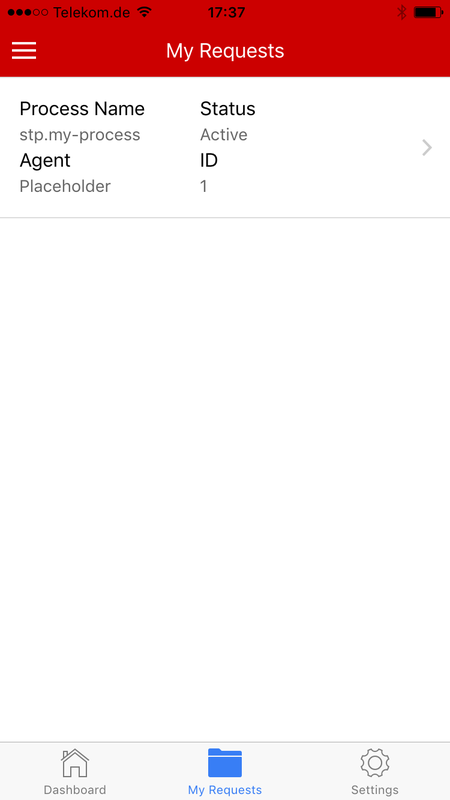 The source code of both applications is hosted on RHMAP which allows us to make use of the built-in build farm (allowing us to create push button builds for iOS, Android et al), configure and also preview the application. For our showcase we’ve implemented a single Node.js based app called Cloud App which accepts all incoming requests from our client layer. RHMAP provides a feature rich development framework (including custom Node.js convenience modules) making the creation of cloud code apps easy and efficient. Through the use of Node.js as our programming language we get all the benefits of its evented and asynchronous model, that works extremely well with our use case of a data intense realtime application (DIRT paradigm). An MBaaS (Mobile Backend-as-a-Service) is the primary point of contact for end user applications – both mobile and web. The MBaaS hosts Node.js applications – as REST API servers and/or Express.js based web apps. 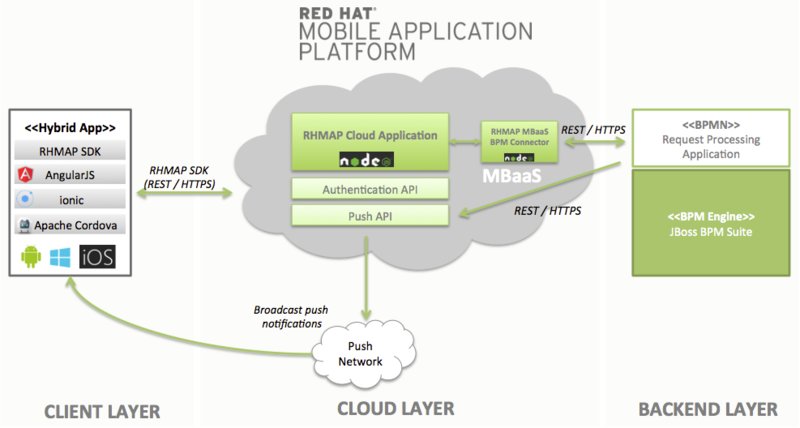 The primary purpose of the MBaaS is to allow users (developers) of RHMAP to deploy Node.js server-side for their mobile apps. The MBaaS also provides functionality such as caching, persistence, data synchronization and a range of other mobile-centric functionality. Multiple MBaaS may be utilized for customer segregation and/or lifecycle management (environments). For this showcase we’ve developed a new MBaaS connector called fh-connector-jbpm-cloud, which is meant to be reused across multiple applications hosted on RHMAP. 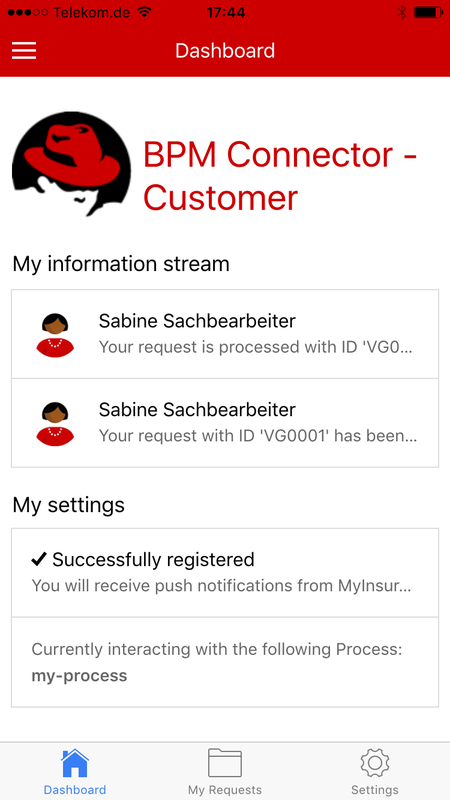 For the use in our project we’ve instantiated it and configured the environment variables to connect to our specific JBoss BPM Suite in the backend layer. 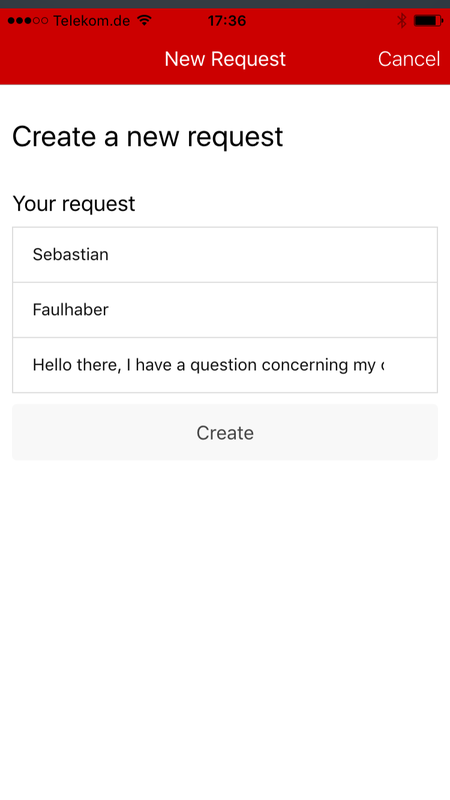 We make use of the RHMAP built-in mobile push API which provides a generic way to interface with multiple push networks (Google Cloud Messaging, Apple Push Notification Service and Microsoft Push Notification Service) via REST or Node.js. 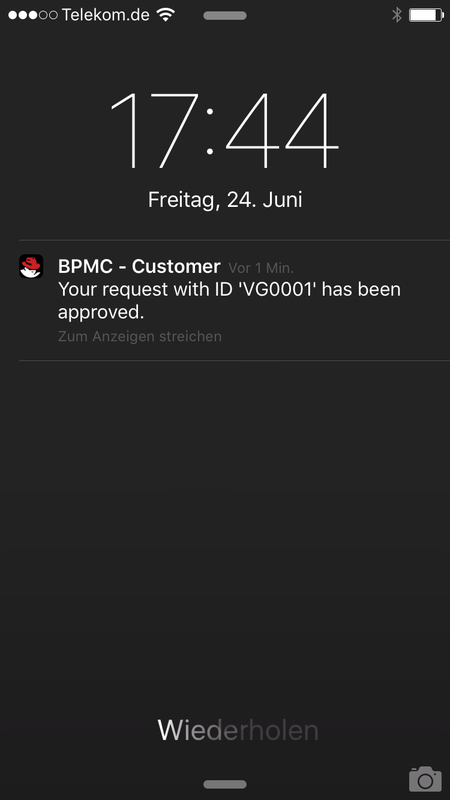 This makes it very convenient to send out push notifications from 3rd party application (such as JBoss BPM Suite as demonstrated in our showcase). This layer is comprised of a large set of different backend systems that typically run inside the datacenter of an organization; such as application servers, databases, messaging systems or ESB-like services. For the sake of this showcase we’ve chosen JBoss BPM Suite ((https://www.redhat.com/en/technologies/jboss-middleware/bpm)) as the only system in here. The BPM Suite provides a full blown authoring and runtime environment for business process applications focused on the use of open standards (such as BPMN 2.0). 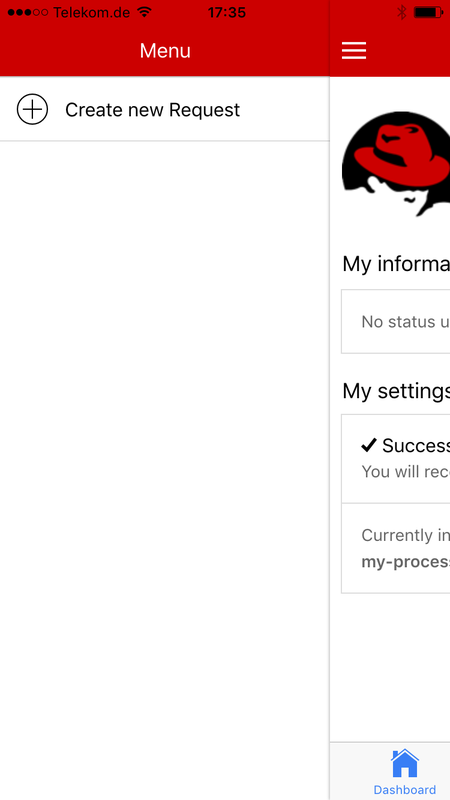 The included BPM engine also exposes a rich REST API that is used extensively by our MBaaS connector fh-connector-jbpm-cloud to start new process instances, control the process flow etc. The core business process for our scenario is implemented as a simple BPMN 2.0 workflow that is being deployed in form of our Java based Request Processing Application. 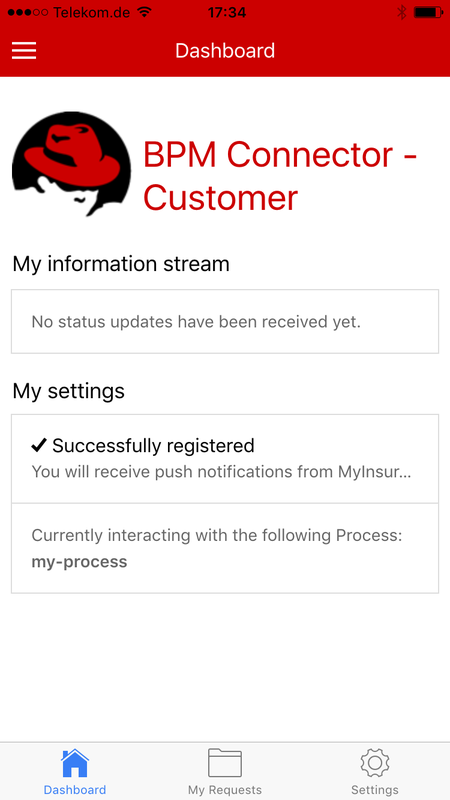 After being instantiated the process firstly sends out a push notification to the requesting customer by simply calling the RHMAP push API. Secondly a human task called Process request is used to create a new work item in the work basket of our employees. 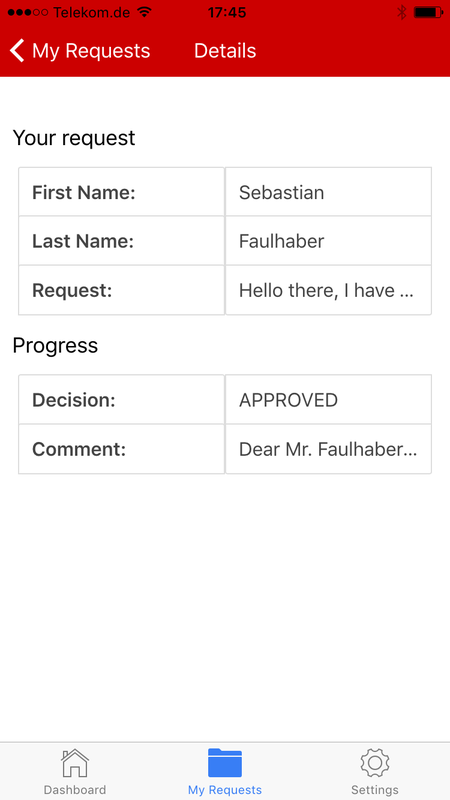 Through our Employee App mobile application we empower remote employees to directly work on the request. In addition to that the work items can be claimed via a traditional web-based application named Business Central, that is provided as part of JBoss BPM Suite. Based on the decision the process completes with an according push notification to inform the customer. 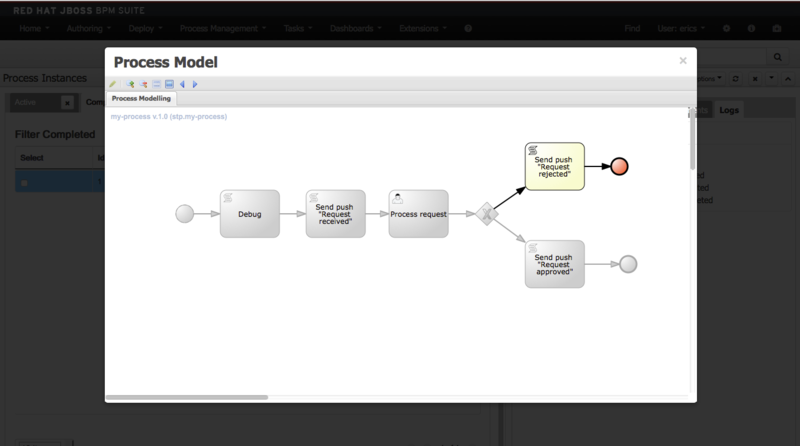 More information on how to develop process applications can be found in the JBoss BPM Suite Development Guide. Special thanks to Sebastian Dehn (sdehn@redhat.com) for implementing large parts of the client layer. Resource limits allow you to set boundaries (max/min & default) for the compute resources a developer can define on pod/container level (see https://docs.openshift.com/enterprise/3.1/dev_guide/compute_resources.html). Browse to OpenShift admin console, select the project and then “Settings”. A quota allows you to set hard limits on the overall resource consumption on project level. This is in particular useful to create a t-shirt size based accounting model (small, medium, large) for OpenShift. See also https://docs.openshift.com/enterprise/3.1/dev_guide/quota.html.